The Swapna Mahal serves a Royal thali – The Maharani Thali (queen’s platter) and Maharajah thali (Kings platter) which embraces not just Rajasthani specialties but also dishes from the Royal Principalities like Nepal, Akbar, Shah Jehan and many more. From a scroll, the very attentive and always smiling server would read out a royal Farrmaan (edict) to initiate your meal for the evening. Don’t be surprised if your meal would arrive with a little announcement and the musicians accompanying them. Thali, a big plate made of either silver or gold, In former times when royal families use to sit down for their meals. 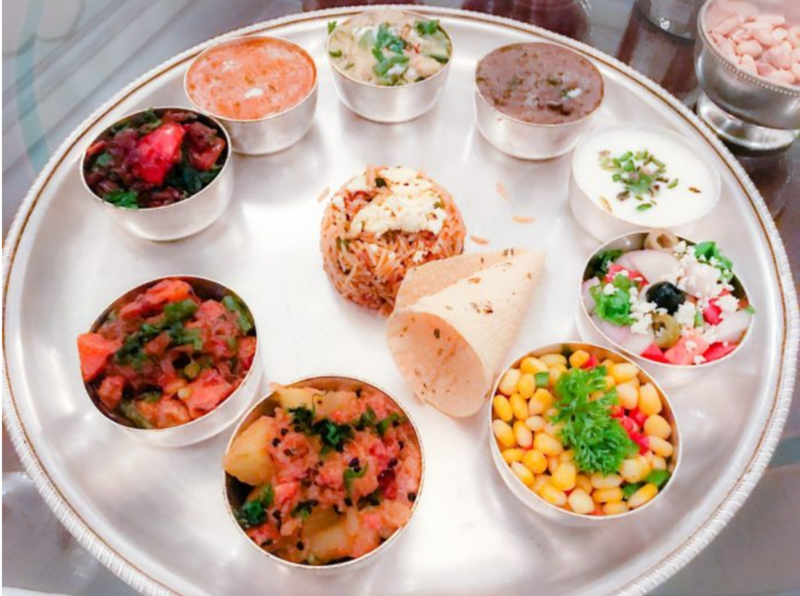 All the choicest dishes, the royal cuisine of various royal families was served authentically, mostly presented in silver or gold Katori’s and served in thali. The importance of the food being served in gold and silver as both metals have curative qualities. Gold possesses a high degree of resistance to bacterial colonization while silver has an infection and fungus resistant effect. The dishes were created by hakims, the royal family doctor, who would keep in mind the health aspects of the food being served. These dishes were used to be cooked by specially trained Khansamas (chefs) who were trained to cook food for the members of the royal family. Ordering thali is like going back to unforgettable days of the royal dining Experience in a palace. The special Rajasthani thali will be served to you in rajputana style. The Vegetable Gulabi Kebab with beetroot will the melt-in-the-mouth winner in starters while the yummy Dal Rajwaadi (royal lentils), the chunky Vegetable Jalfrezi (mixed vegetables), the moreish Kofta Shahi Zafraani (dumplings in creamy gravy), the simple Subz Korma Kesariya (vegetables in saffron flavored base) and the perfectly cooked Sultani Bhindi (ladyfinger) will be all delightful. But the Royal Nepalese Potato – a delightful mustard seed tempering with a hint of tanginess will steal the show. Served with a side of salads and Shahjahani Raita, the meal will be royal delight. To sweeten the meal, a selection of cut fruits, ice cream and Shahi Jamun (small Gulab Jamuns or deep fried milk-solids based balls dipped in sugar syrup) will be served. It will be Sumptuous, Delicious and yes very royal ! !